We stayed in Sion Hotel Bromo, it was a beautiful starry night and the temperature was cold. We woke up at 3 a.m in the morning, rented a Jeep and we are escorted to the tourist spot to see the first morning light with the view of Mount Bromo. We waited until the sunrise under the sky full of stars. It was so beautiful to see the dark slowly faded away by the light and we started to see the whole mountain view. Afterwards, we went down to Bromo Crater. We rode horses to climb half of the mountain, and then we continue by walking up the stairs. On top of the mountain (+2.339m DPL) we saw the crater quite close to us, and we also can see a beautiful desert of Bromo Area down under. We continue our journey by Jeep to Savana, where we can see a greener area of Bromo, and the desert of “Pasir Berbisik” movie setting area. 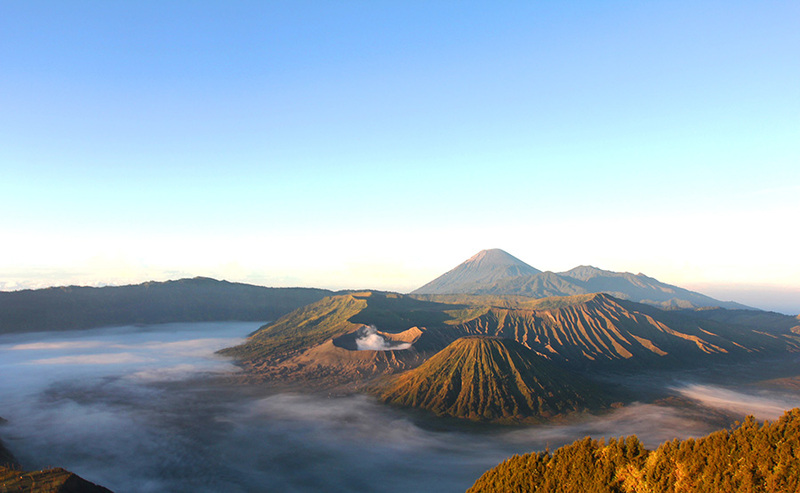 They are also located around the Bromo crater and can be reached in 15 minutes drive. We finished our journey and came back in 10 a.m in the morning back to the hotel.